November | 2012 | Desert Diamond Industries – Your Safety… Our Priority! Do you cut buried pipe or conduits? If so, then the Ductile Iron Ring Saw Safety Blade can make your job easier and safer. The Ductile Iron Ring Saw Safety Blade – when used on a specially designed ring saw blade – cuts up to 10″ deep, twice as deep as other 14″ diamond blades. Deeper cuts can mean less excavation, which in turn can increase your safety. Not only that, but the Ductile Iron Ring Saw Safety Blade cuts almost anything, including ductile iron, PVC, HDPE, RCP, clay and ceramic pipe, concrete, wood and almost anything else that you’ll encounter in the field. 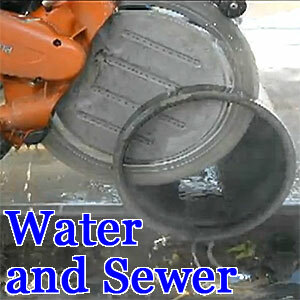 This entry was posted in General Information, Video and tagged Ductile Iron Ring Saw Safety Blade, Sewer, Video, Water on November 30, 2012 by Desert Diamond Industries. We like saying that the Ductile Iron Safety Blade is better than abrasive blades. You shouldn’t take our word for it, though. Instead, let’s see what one of our customers – a Superintendent of Underground Crew in Cincinnati, OH – has to say. This superintendent won’t have to worry about the Ductile Iron Safety Blade shattering during cutting because it’s made of solid steel with a vacuum-brazed diamond coat. This solid steel design eliminates the chances of saw operators being injured or killed by shattering or exploding abrasive blades. The Ductile Iron Safety Blade’s vacuum-brazed, solid steel design gives it several other advantages over abrasives, as well. For one thing, the Ductile Iron Safety Blade doesn’t emit hazardous silicon carbide fibers during cutting, the way abrasives do. Silicon carbide can cause pneumoconiosis and increase the chances of death from various lung diseases. There’s even limited evidence that silicon carbide can cause lung cancer in animals. Reducing silicon carbide on worksites can therefore lead to healthier workers with less down time and reduced health insurance costs. The Ductile Iron Safety Blade can also reduce your replacement blade costs, because they outlast abrasives by at least 150 to 1. Think about that ratio for a minute. Good 14″ abrasive blades cost from $4 to $8 apiece, which means that 150 of these blades will cost you anywhere from $600 to $1,200! Not only will the Ductile Iron Safety Blade stay on your saw longer and save you money, but you also won’t have to stop cutting nearly as often to replace worn blades, saving you time. For more feedback from our customers about Desert Diamond Industries’ diamond blades and grinders, visit our testimonials page. “Q. What’s the Difference between Abrasive Wheels and Blades and Diamond Grinders and Blades?” Desert Diamond Industries Blog. Desert Diamond Industries, 16 Nov. 2012. Web. 28 Nov. 2012. <https://desertdiamondindustries.wordpress.com/2012/11/16/q-whats-the-difference-between-abrasive-wheels-and-blades-and-diamond-grinders-and-blades/&gt;. “Testimonials.” Desert Diamond Industries. Desert Diamond Industries, n.d. Web. 28 Nov. 2012. <http://www.desertdiamondindustries.com/index.php?p=testimonials&gt;. This entry was posted in Testimonials and tagged Ductile Iron Safety Blades, Sewer, Testimonials, Utilities, Water on November 28, 2012 by Desert Diamond Industries. Comments from the users of your product are very favourable. The discs are very aggressive when used for angle grinding or facing of pipe. Typical resin discs quickly glaze over and/or wear unevenly (i.e. radius the edges) making them ineffective where as [sic] the [Safety Blade Grinder/Cutters] will repeatedly produce flat surfaces suitable for root face (land) preparation on pipe sizes up to NPS 6”. The holes in the disc also allow the operator to monitor the progress of the preparation without removing the grinder from the surface. Because of the aggressive grit there is an increase in vibration experienced by the grinder operator but is not intrusive. As a non-consumable type of disc the amount of air bourn [sic] particulate is almost nil, greatly reducing the hazards to the users and occupants of the work area. At this point in time we do not have information on the cost effectiveness of using the [Safety Blade Grinder/Cutter] vs. others. The Safety Blade Grinder/Cutter is so aggressive, as this instructor noted, because of its thick coat of vacuum-brazed diamond (up to 85 percent concentration). It also reduces airborne particulates because of its solid steel construction. In fact, it doesn’t emit any silicon carbide fibers, like abrasive wheels and stones, during cutting or grinding. In addition, its solid steel design won’t contaminate surfaces like abrasives, so welders spend less time cleaning and brushing and more time welding and earning money. The Safety Blade Grinder/Cutter also increases worksite safety because it won’t shatter during grinding, like abrasives. This entry was posted in Testimonials and tagged Abrasive Grinders, Abrasive Stones, Abrasive Wheels, Foundries, Ironworking, Metalworking, Safety Blade Grinder/Cutter, Water, Welding on November 26, 2012 by Desert Diamond Industries. The Ductile Iron Safety Blade and Fire Rescue Safety Blade have diamond grit vacuum-brazed onto steel cores – unlike other diamond blades, which have sintered or metal-bond cutting segments. This vacuum-brazed design gives these blades a different wear pattern from other diamond blades. Knowing what this wear pattern looks like will improve the performance and, most importantly, the safety of your blade. If you do need to replace a worn Ductile Iron Safety Blade or Fire Rescue Safety Blade, just visit Desert Diamond Industries’ web site. You can also call us within the United States at (800) 654-5890 or internationally at 0011 1 702 465 0093. This blade is new and unused. The diamond grit is sharp and pronounced. As the diamond wears down, the blade will become duller. In some cases, the diamonds form a wear pattern in the opposite direction of blade rotation, typically after cutting metal. If you see this on your blade, just flip it over so that this wear pattern spins into the cut. Doing so will help restore your blade’s like-new performance. This segment is worn, showing signs of heavy use on steel. It has possibly a quarter of its life left. Your blade will show signs of slowing down at this point. Make sure a backup is available. If not, it’s time to consider buying a new blade. This blade is completely worn out. Do not use a blade that shows bare steel like this. Remove it from your saw and from service, even if there is diamond grit on the side of the cutting edge. Vacuum-brazing places a single layer of diamond on the blade’s cutting edge, so the blade must be replaced once this layer is worn down. This level of wear is not covered under our Life Time Operator Error Warranty. 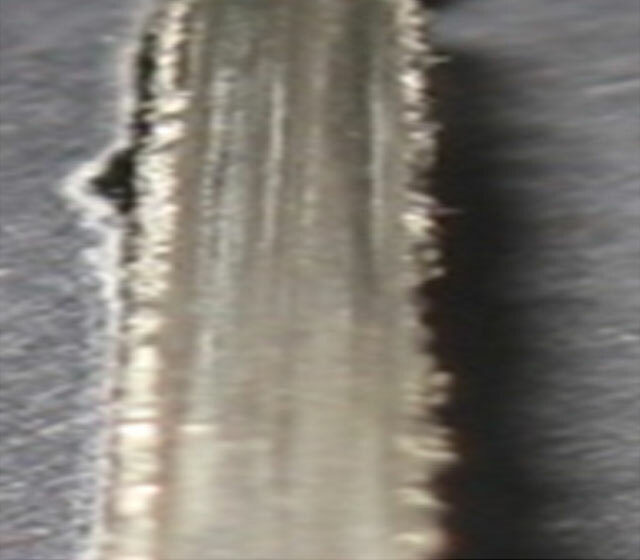 Keep in mind that Ductile Iron Safety Blades and Fire Rescue Safety Blades have diamond grit on the sides of the cutting segments, as well as the cutting edges. Thus, your blade may wear like this one, with worn cutting edges but fresh side grit. If your blade looks like this, we recommend replacing it. 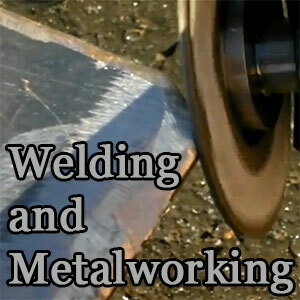 It may still work for side grinding or beveling, but it’s shot as a cutting blade and should be replaced. This level of wear is not covered under our Life Time Operator Error Warranty. This blade is extremely worn, with bare steel showing on both the cutting edges and sides. This is not safe or recommended. Replace your blade before it looks like this, preferably long before. This level of wear is not covered under our Life Time Operator Error Warranty. Desert Diamond Industries. 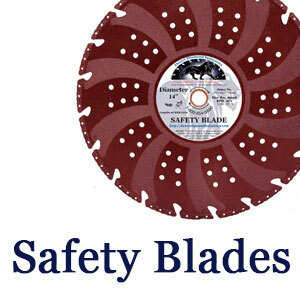 “Know When to Replace Your Safety Blade.” Desert Diamond Industries Product Catalog. N.p. : n.p., 2011. 28. Print. This entry was posted in General Information, Safety and tagged Ductile Iron Safety Blades, Fire Rescue Safety Blades, General Information, Safety on November 21, 2012 by Desert Diamond Industries. The operator loves it, he wants ’em. We’re not 150 to 1 yet, but we’re about 60 to 1… He doesn’t have to change blades, it cuts easier, it doesn’t throw sparks… We’ve only had it a week, but I can tell you right now, it’s better… I’d like to get another one in here when that thing wears out so we don’t have to go back to abrasives, that’s what I want. The Ductile Iron Safety Blade’s thick vacuum-brazed diamond coat (up to 85 percent concentration) outcuts abrasive blades in heavy-duty applications like metal cutting, metal working, manufacturing and fabriaction. It’s been proven on iron, steel, bronze, copper, chrome, zinc, lead, high nickel-content materials and Hastelloy “superalloys”. In addition, the Ductile Iron Safety Blade’s solid steel design (up to 14″) outlasts abrasives up to 150 to 1, reducing your replacement blade costs. Best of all, the Ductile Iron Safety Blade’s solid steel design improves worksite safety and worker health. Its solid steel construction won’t shatter or explode like abrasives, reducing workplace injuries and fatalities, and it won’t emit hazardous silicon carbide fibers during cutting, reducing lost time and health insurance costs. 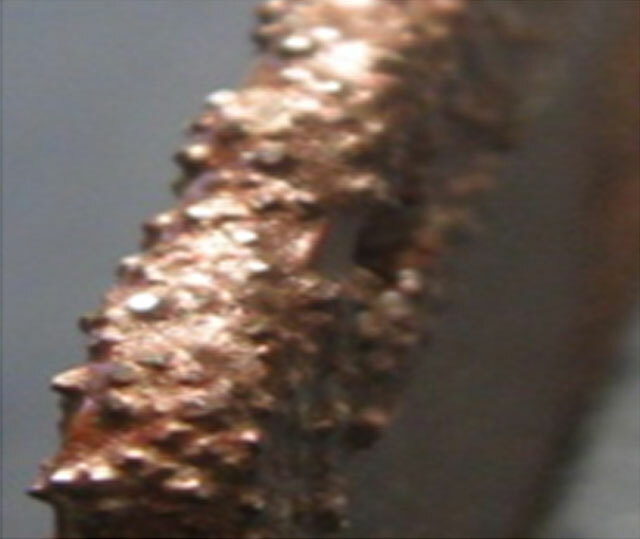 This entry was posted in Testimonials and tagged Ductile Iron Safety Blades, Fabrication, Foundries, Ironworking, Manufacturing, Metalworking, Testimonials on November 20, 2012 by Desert Diamond Industries.